Back on 17th April 2011 I wrote about Benitos Hat opening a branch in Oxford Circus. 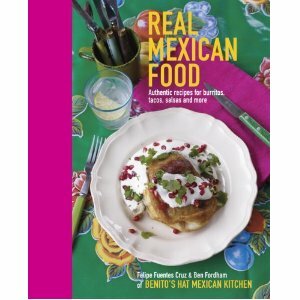 Well now here I am again to write about the fact that they have written an excellent cookery book: Real Mexican Food. It won't be out until August, but you can get a bargain if you pre-order it. I am thrilled for Felipe, my friend Siobhan's husband. If you like Mexican food you just have to pre-order this book. If you like the food at Benitos Hat - what's not to love! - then you have to pre-order this book.